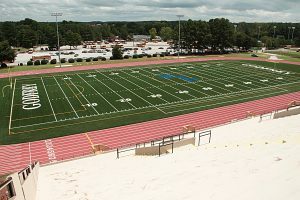 Buck Godfrey Stadium plays host to Middle School Football Trail to the Title Championship game on Saturday at 10:00 am. Defense has been at the forefront of the DeKalb County middle school football season all season and the Trail to the Title semifinals were no exception as a pair of defensive struggles determined the two finalists for the championship this past Saturday at Godfrey Stadium. The semifinal opener had the Tucker Tigers (8-0) pulling out a 10-6 win over the defending champions Stephenson Jaguars (6-2) to put the Tigers into their county record fifth consecutive title game. Stephenson drove down on its opening drive of the game and scored on an eight-yard quarterback keeper by Dylan Milbry to go up 6-0. The Tigers’ defense stopped the two-point conversion try. A muffed punt by Stephenson was recovered by Tucker’s Latavius Johnson in the second quarter to set the Tigers up deep in Stephenson territory. Christian Johnson turned the Jaguar mistake into a touchdown going 16 yards to tie the game at 6-6. Joshua Morgan ran in the two-point conversion to give the Tigers an 8-6 lead heading into halftime. The Tigers were driving in the third quarter when Stephenson’s Myron Henderson intercepted a pass in the end zone and returned it to the Jaguars’ five. The Tigers defense dropped a runner for a loss. On the second play following the interception Tucker’s Omari Gordon sacked the Stephenson quarterback for a safety to make it a 10-6 game in favor of the Tigers with less than a quarter to play. Stephenson recovered the kick following the safety at the Jaguar’s 40 with a chance to get the go-ahead score late in the game. Morgan came up big for the Tigers’ on defense as he forced a fumble and the Tigers recovered to seal the victory. Tucker enters the final for the fifth consecutive season having won the 2013 and having lost the past three. The Tigers have won 30 consecutive regular season games and 11 of its last 14 playoff games. The Bethune Lions used a smothering defense to upend the Lithonia Bulldogs (6-2) 16-6 last Saturday at Godfrey Stadium to advance to the Trail to the Title Championship. The Lions got a pair of first quarter touchdown runs from running back Rashod Dubinion (10 carries, 75 yards) to take an early 16-0 lead. The defense took over from that point picking up sacks, a fumble and an interception while allowing the Bulldogs just the one score. Lorenzo McCall had six tackles, including 2 sacks and a force fumble, to lead the Lions’ defense. John Harris (4 tackles, 2 sacks), Caleb Pace (3 tackles, 1 sack) and Jayden Freed (5 tackles, 1 sack) got in on the sack parade for the Lions. Tavion Roberts led the Bulldog defense that held Bethune scoreless after the first quarter with nine tackles. He also scored the Bulldogs only touchdown as he broke away for a 34-yard score. Other contributors on defense for Bethune were Janirian Bonner (10 tackles) Santana Walton (6 tackles, 1 fumble recovery), Jamel Nelson (5 tackles), Dubinion (5 tackles) and Demtress Broughton (interception). Bethune gets its third chance for a Trail to the Title Championship trophy. The Lions made the finals in 2008 and 2011, but could not get the win. This will be the fifth consecutive meeting of undefeated teams for the Championship as No. 3 ranked Tucker hosts No. 4 ranked Bethune at 10:00 am on Saturday for the title.